We’d reached the last day of our vacation. As the pattern had been set, we slept in and had breakfast at the hotel and then checked out. The trip back to the Flagstaff airport was uneventful but it’s always a surprise to check into a small airport. The distance from the rental car return to the plane itself was a couple of hundred feet at best. We arrived a couple of hours early as is the norm for larger airports. The flight before ours hadn’t yet departed so we had a bit of time to kill. We stopped into the coffee shop and had coffee but it was served in a mug instead of the usual styrofoam. Security lines were at most 3 deep. Did I say lines? I mean the security line singular. Our Dash 8 sat on the tarmac waiting for us. After we checked in through security, it was surprising to see that one had to leave the secure area to go to the restroom. But getting back was no big deal. Seat assignments were a bit unusual. Seats were assigned sequentially. Keith was in 6F, Betty was in 7A. It was a short flight but just seemed unusual. Both had window seats but they were in different rows on opposite sides of the plane but that’s not very far apart in a Dash 8! Seated next to Keith was a woman with a European accent. She saw him taking pictures out the window and asked if he would snap a couple for her. He obliged and probably took about as many with her iPhone as with his camera. You’ll see the results from his camera below. We changed planes in Phoenix to another Airbus for the crowded flight to BWI. Current protocols for flights cross country involve selling food from a center aisle cart which starts up front in business/first class and those in the last few rows are limited to whatever wasn’t sold to the front half of the plane. We ended up with the snack packs but it got us home. When we arrived in Baltimore, it was raining lightly and late in the evening. We got home around midnight after retrieving the car from long term parking tired but satisfied that this trip of a lifetime had been rewarding. Ratings wise, the bed at our house was a world better than the one in the hotel but after a certain time in life, that is to be expected. 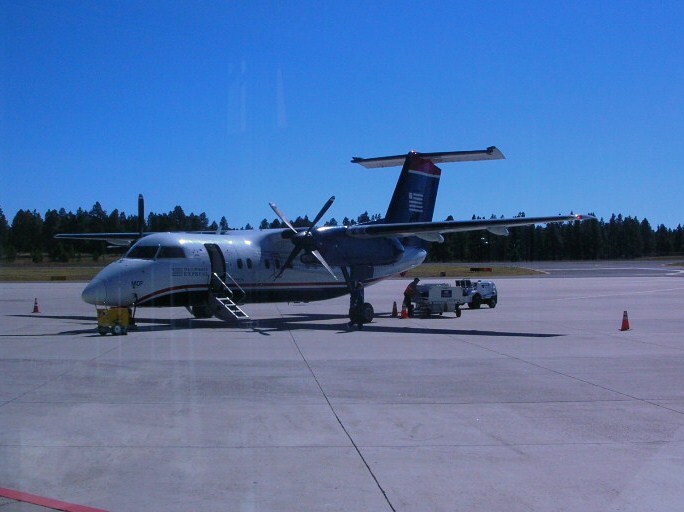 This entry was posted in Arizona trip and tagged airplane, Arizona, Dash 8, prop, travel by Keith. Bookmark the permalink.